FOXBORO, Mass. — Determined to squeeze every ounce of productivity out of their players, the New England Patriots have turned a receiver into a part-time cornerback, a linebacker into a part-time tight end and a defensive tackle into a part-time fullback. Turning Stephen Neal into a football player. Neal, who will start at right guard Sunday when the Patriots play at Pittsburgh in the AFC championship game, didn't play a shred of football in college. He was a star wrestler at Cal State Bakersfield, where he won two consecutive NCAA Division I titles and in 1999 was given the Dan Hodge Award, the Heisman Trophy of college wrestling. 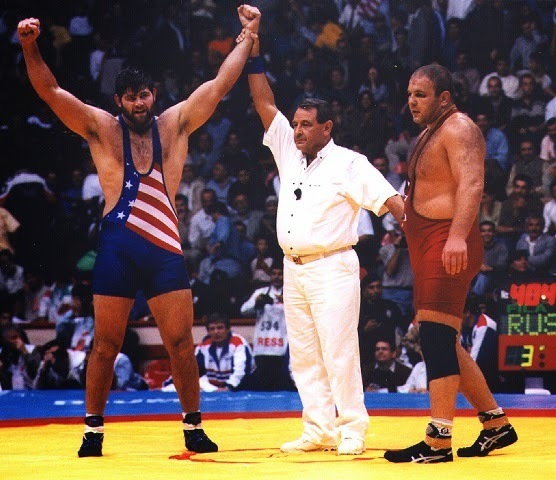 He went on to win the U.S. freestyle championship, the Pan-American Games title and the world championship. Once, while competing in Iran, he happened upon a poster of himself. It was 15 feet tall. So what would drive a man in his early 20s to start at the ground level of one sport after reaching the summit of another? It's a question that crossed Neal's mind more than once in 2001, when the Patriots signed him as a rookie free agent and the rawest of prospects. "I had a lot of days in training camp where I'm just lying in bed, trying to get a nap, and all I could think of was 64-protection," Neal said. "I'm just thinking all the possibilities and my head's just spinning. It was kind of frustrating, but then later on you kind of understand it a little bit more." It was almost by happenstance that the 6-foot-4, 305-pound Neal, 28, became an NFL player. Since he was a kid growing up in San Diego, he wanted to play football. And he did play at San Diego High, where he was a five-sport athlete who also competed in track and field, tennis and swimming. Wrestling was his passion, though, and he once pinned Ricky Williams in a high school match. Neal always maintained an interest in playing football, and after college a wrestling friend introduced him to agent Neil Cornrich, who represents several NFL players. A couple of years earlier, Cornrich noticed Neal while attending a wrestling tournament at Ohio State with former NFL players Kirk Lowdermilk and John Frank. "We were watching this guy who looked like a California surfer enlarged," Cornrich said. "We were amazed at how he was beating someone so effortlessly, how uncannily athletic he was. He was freakish." When they finally met, and Neal expressed an interest in taking a crack at pro football, Cornrich sent a tape to the Patriots and arranged a workout for him in front of Coach Bill Belichick. To prepare for that, Neal spent a week living at the home of Dave Kennedy, Ohio State's former strength coach. "All he did was sleep, eat and work out," said Kennedy, now strength coach at Nebraska. "My kids thought he was a big bear. He'd sleep from 1 in the afternoon until 10 at night, then he'd get up and go to McDonald's." Neal's dinner of choice: two double quarter-pounders and 25 McNuggets. "Then," Kennedy said, "he'd go back to sleep." Strange as it sounds, that regimen paid off. Neal impressed Belichick enough that the Patriots signed him for training camp. He spent a month with the team before being waived, then was signed to the Philadelphia practice squad. New England didn't forget about him, though, adding him to its active roster in December 2001 before making a Super Bowl run. Although he was inactive for the last three games of the regular season and throughout the playoffs, he clearly had piqued the interest of the eventual Super Bowl winners. "He had the skills, tools and emotional makeup we look for," said Scott Pioli, New England's vice president of player personnel. "We had no idea if those skills would translate into football ability." There were some embarrassing moments early on, times when he blanked instead of blocked. "Coaches started yelling at you, and you just sit here and there's nothing I can say," he said. " 'Sorry. I screwed up.' "
The real test came in the 2002 season. Neal broke in against Miami in October, then got his first start against Green Bay. He injured a shoulder while recovering a loose ball and was out for the rest of the season. The shoulder bothered him last season and he sat out on injured reserve. That gave him time to concentrate on learning the nuances and many responsibilities of his job. He learned them well enough to earn a starting job this season. "Some things carry over" from wrestling, he said. "Hand placement, leverage, mental toughness. But for the most part, it's completely different because it's 11 people on the field who are teammates, versus one person on the mat. "I could knock someone on the ground, but if it's the wrong guy something bad could happen. So you have to do your job and everyone around you has to do their job. In wrestling it's just you go out there and try to dominate your opponent, put on a show for the crowd, do whatever you can do to try to win." It sure is. Wrestling took him to Bulgaria, Turkey and Western Europe. It took him to Colombia, where he was protected by armed guards. It took him to Iran, where he stayed across the street from the U.S. Embassy, where the hostage crisis took place from 1979 to 1981. For a time, Neal was the best in the world at what he did. Now, he's just trying to fit in.